Whatcom County is a wonderful place for amphibians, but unfortunately, that has also made it a great home for two invasive amphibian species. The American Bullfrog and the Green Frog are both native to the eastern United States and were introduced through a variety of ways, including farming for frog legs, the pet trade, and as additions to ornamental ponds. They have also been migrating from British Columbia, where they are very well-established. Why do we care about about the presence of invasive American Bullfrogs and Green Frogs in Whatcom County? American Bullfrogs and Green Frogs can compete with our native species of amphibians and have been implicated in the decline of some native species. They also consume wildlife species other than amphibians. Although we know American Bullfrogs are widespread in our county, we don’t have documentation of exactly where they are, and maybe more importantly, where they are not. Whatcom County is the only place in Washington State where Green Frogs have become well established. The Washington State Department of Fish and Wildlife has no real documentation of their presence and extent. It is important that this species be documented to see how it affects our native species and if control is necessary. We hope that we can use Citizen Scientists to expand that data on these species and you can help! This summer, WCAMP will be conducting call surveys for American Bullfrogs and Green Frogs from July through August! We have various sound clips of Bullfrog and Green Frog calls set up to listen to so you can get to know their calls, as well as to test out your identification skills. We’ve identified some areas and routes throughout Whatcom County to conduct call surveys. Each route or area has several survey points accessible from the road or by trail to conduct these surveys. At each survey site, wait 5 minutes before surveying for 5 minutes. Any disturbances made by approaching footsteps can disrupt breeding activity. The 5 minute waiting period gives the frogs time to resume their normal activities. 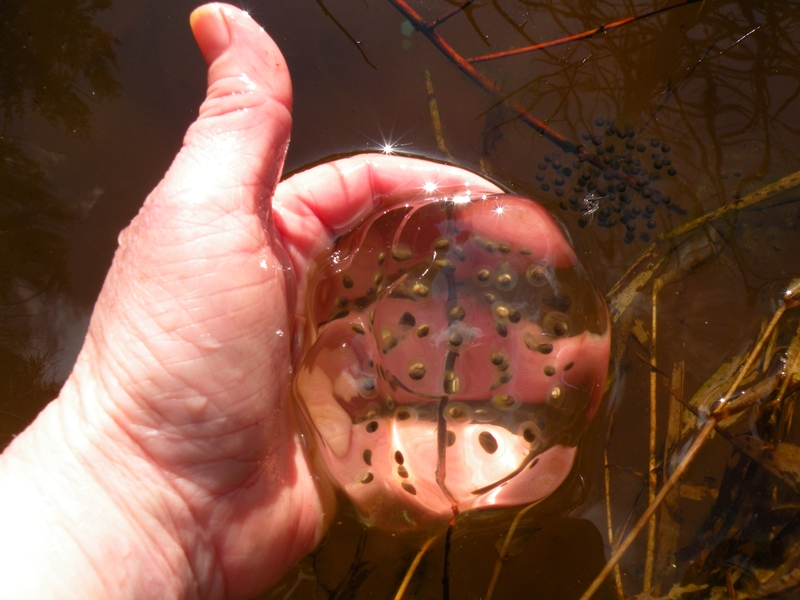 Each site should be visited up to 3 times throughout the season, similar to the egg mass surveys. Once both Green Frog and American Bullfrog presence is detected at a survey site, the survey for that site is complete! Surveys can be conducted any time, but breeding activities have been known to be higher after sunset. More specific instructions on conducting call surveys are provided below. Surveying with a partner is recommended for safety, but can be done individually. If you are interested in volunteering, please take a look at our map and sign up for any open routes/sites. If you’d rather do some of your own exploring, feel free to find your own survey sites. Just let us know the location or coordinates so we can add it to WCAMP’s survey map. Zoom in to see different survey areas/routes (lines) and their survey points (pins). Each survey area or route will have a specific name with numbered survey points. Yellow pins indicate open sites for survey. Red pins indicate sites already taken and if you click on them you will see the results. To register for a site on the map or to register for your own site click here. If you’d like to take part in WCAMP’s call surveys this summer, the resources below will prepare and provide you with the materials necessary to conduct surveys. How to identify calls? Learn to identify the different calls made by American Bullfrogs and Green Frogs through various sound clips and videos. Amphibian habitats Learn to distinguish the different types of habitats utilized by amphibians. Call Survey Procedures Once you’ve chosen a survey site, collect data following these instructions on how to conduct call surveys. Click here for a printable copy of instructions. Data Sheet Print a data sheet to take with you to record your data during survey. Call Survey Online Data Form Please record your American Bullfrog and Green Frog data on our online data form. FYI, I found the bullfrog at Lake Louise in June, 2015. See https://www.inaturalist.org/observations/1607894 for documentation. Thank you. We will get that logged! I nearly stepped on a bullfrog today at the Whatcom Humane Society property while walking a dog on the trail near a drainage ditch. This is quite close to one of your sampling sites. That site, a stormwater retention pond, was recently dredged. As water slowly refills the pond, I assume that bullfrogs will follow. Thank you. We will get that logged.